At the end of Deadpool, there wasn’t an end-credits tag where Cable showed up, but Deadpool himself did announce that the time-traveling mutant would be appearing in the sequel. So now that Deadpool 2 is officially on its way, the writers have to deliver on that promise. Speaking to Collider, Deadpool writers Paul Wernick and Rhett Reese explained that they plan to tackle Cable’s backstory by... not tackling it. For the uninitiated, a very streamlined version of Cable’s backstory involves him being the son of Cyclops and a clone of Jean Grey. And then he’s raised in the future and, as an adult, sent back in time to when he would have been a child had he not been time traveled as an infant. Yeah. And Deadpool 2 isn’t bringing Cable in with, say, an X-Men movie already explaining that. In all honesty, maybe just sort of leaving Cable’s backstory up to the viewer to imagine is the best way to go here. 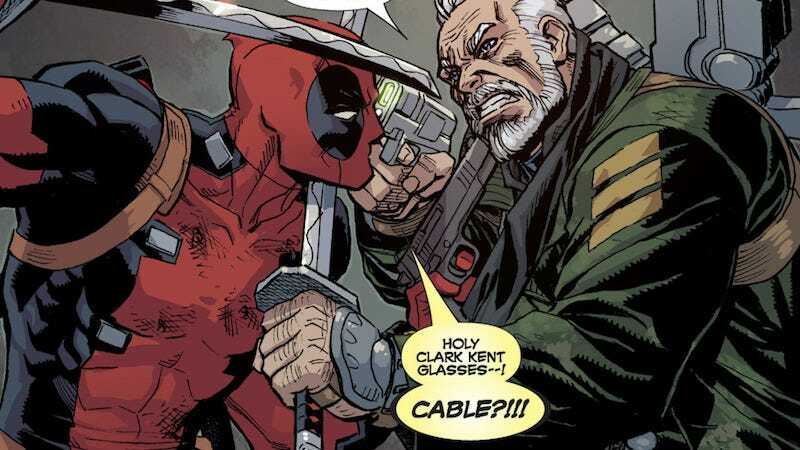 We want to see Deadpool and Cable interact, not spend an hour just trying to explain where the hell he comes from. The important thing for the purposes of Deadpool is that Cable has a very strong moral compass and a devotion to a mission of saving mankind. Deadpool is....Deadpool. Seriousness is not his deal. The interplay between the two of them is what we want to see.